When we bought our house this past summer, one of the big projects that we tackled was a complete kitchen renovation. I am so excited to finally share the before and after pictures! Of course, it’s my favorite room in the house. After cooking in really small kitchens for most of my life, this kitchen is a dream come true. 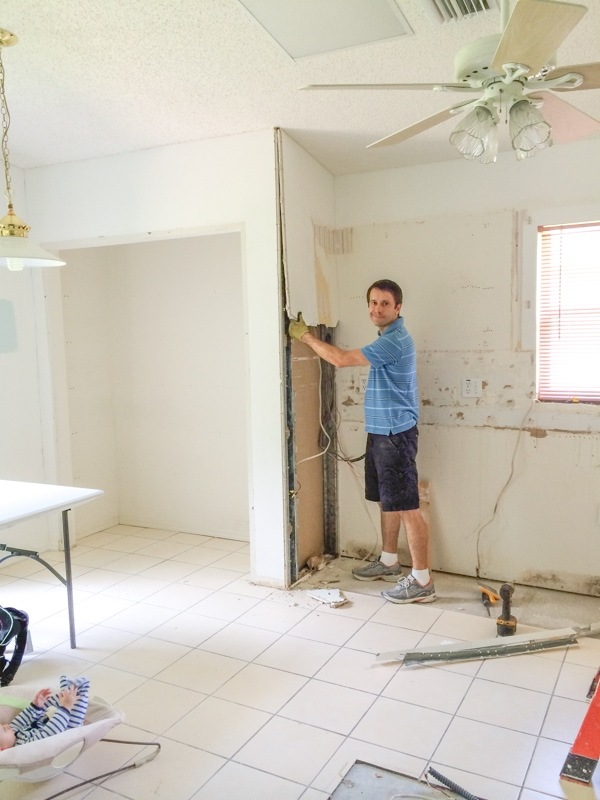 When we bought the house, the kitchen was in pretty good shape, but since we knew that we wanted to update it, and eventually replace the appliances and the cabinets, we put our head together and started crunching numbers. We were so pleased to figure out that we had saved enough to afford a remodel, so we decided to do so right away. This way, we were able to do most of the dirty work before we even moved in. 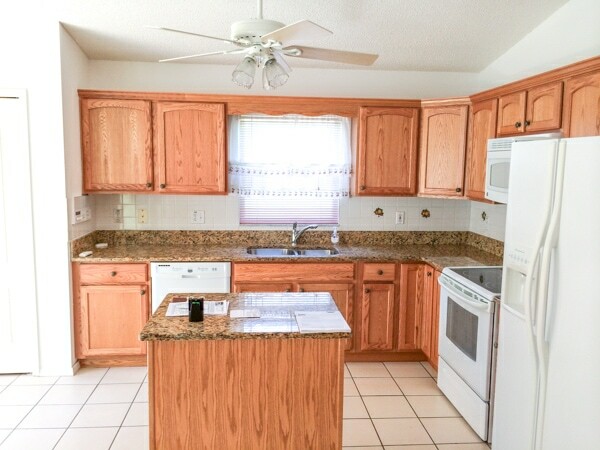 With a budget in mind, we began searching for good deals, buying some things second hand, doing almost all the work ourselves with lots of help from family and selling the existing cabinets and appliances on Cragislist, we were able to do the entire kitchen renovation without going into debt. Now that I think about it, almost everything in the kitchen was bought used, on sale or for a really good price. I can really see God’s blessing in every step of the renovation. We gutted the entire kitchen! All 17 x 9 feet. As I already mentioned, we sold all the appliances, cabinets and the countertops on Craigslist, which was a welcome bonus addition to our budget. It also was a great way to save on the amount of trash that we accumulated and had to get rid of. We also reconfigured the layout of the kitchen. We moved the refrigerator, putting a double oven in its place, and got rid of the existing pantry and installed the refrigerator and a large built in pantry around it. While we were working on the kitchen, I had to become creative about cooking meals without any appliances, very little storage and work space and even had to use the sink in the garage to wash dishes. It certainly didn’t help that it was July/August in Florida and I was using the unairconditioned sunroom as my temporary kitchen. You can read more about my experience with cooking without a kitchen here. Here it is – the completed kitchen! Looking at this view takes my breath away. The new layout is very functional and looks so much better too. As you can see, the cupboards are much taller than the previous and make the kitchen look much bigger. I have so much space, I don’t even use all of it. The rest of the kitchen: Behr Irish Mist Our dining room is the same color, so they seamlessly flow together. 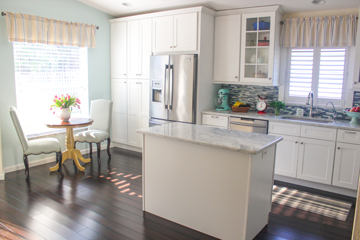 We replaced the dated kitchen tile floor with Peking Antique Click Strand Bamboo flooring from Lumber Liquidators. We used this same type of flooring throughout the entire house. It’s very durable and we love the color. We also got a lot of advice from floor experts that hardwood floors aren’t the best choice for Florida, since the air is so humid and moist that many times the floor will buckle over time. This was a huge project, but well worth the effort. 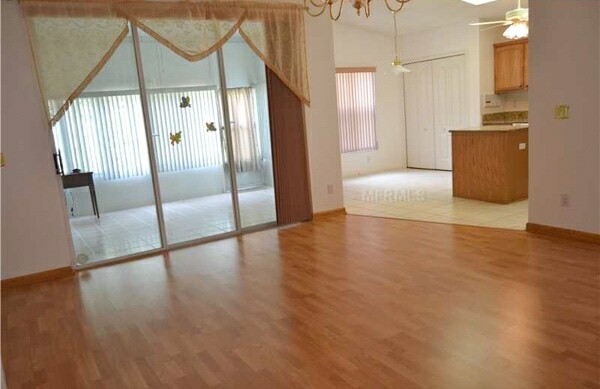 The rest of the house had laminate flooring, which we also carefully removed and sold on Craigslist. Extra cash in our pockets and no trash to get rid of! We worked with a local cabinet and stone company, Five Star Stone. The owners are friends that we know from church. They gave us a really great deal on the cabinets and countertops, which is the main reason we could even afford the kitchen renovation. 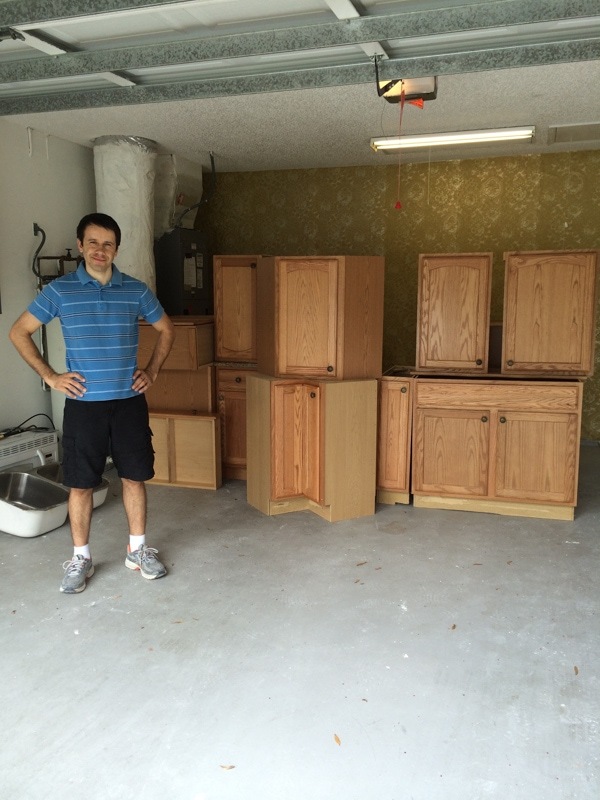 Since the cabinets aren’t custom made, but are bought already assembled, we were able to save a huge chunk of money. 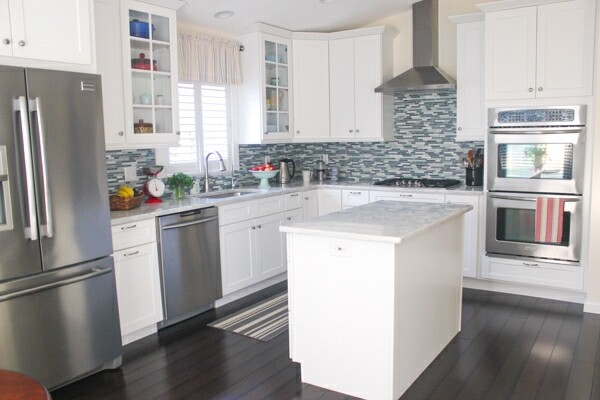 The cabinets: White Shaker Style cabinets. 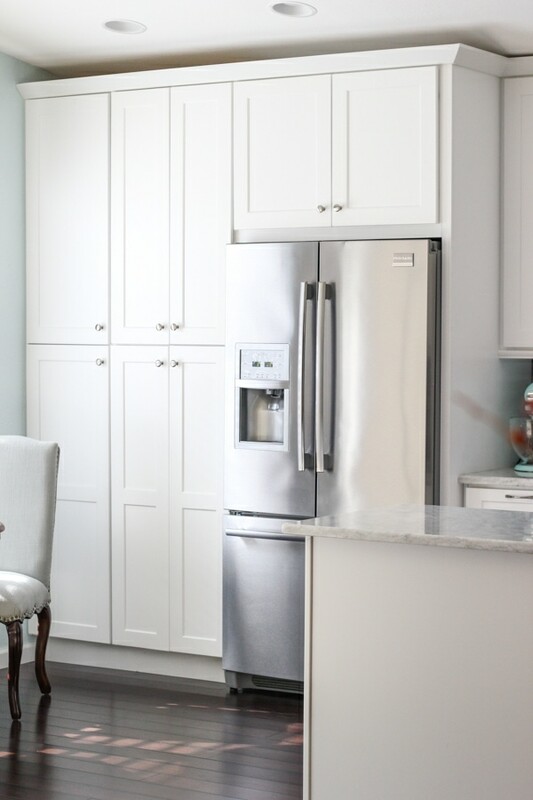 I’ve always liked white kitchens, and I really like the simple, timeless look of these cabinets. A white kitchen is so bright and cheerful. I get asked a lot if they are hard to keep clean. 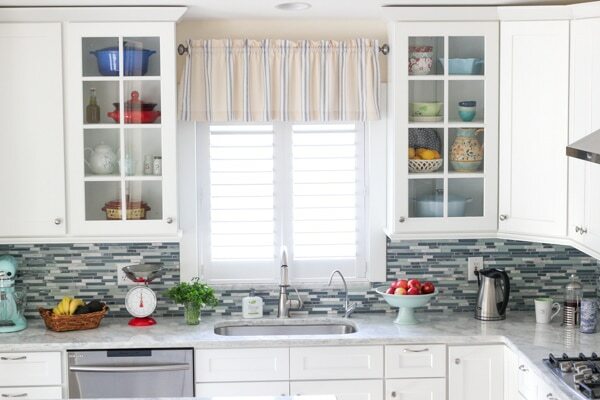 I’ve had white kitchen cabinets for many years now, and they are really easy to maintain. I think it makes it much easier to keep clean, since it’s noticable if something gets splattered or spilled and you can wipe it up right away. 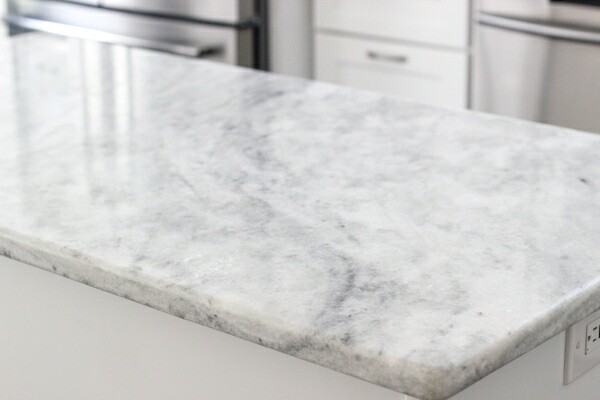 The countertops: White Everest Granite. We really liked the look of Carrarra marble, but were a little apprehensive about the upkeep. Even though marble is very durable and absolutely stunning, it’s also very porous and stains easily. We knew that granite was a better choice, but we had a really hard time finding the color that we wanted. We were thrilled when we found this granite, called White Everest. It looks so much like the Carrara marble that we wanted, and we couldn’t be happier with our choice. The light color means that I don’t have to be polishing it all day too, since it’s very forgiving, which is a big plus for me. Dark granite shows every little speck of dust and water stain. Cabinet Hardware: Amerock Allison Hardware Pull Arch Satin Nickel and Amerock Allison Round Drawer Knob in Satin Nickel We bought the cabinet hardware on Amazon and let me tell you, it is SO much cheaper to buy them online than in the store. Especially when you buy in bulk, like we did. 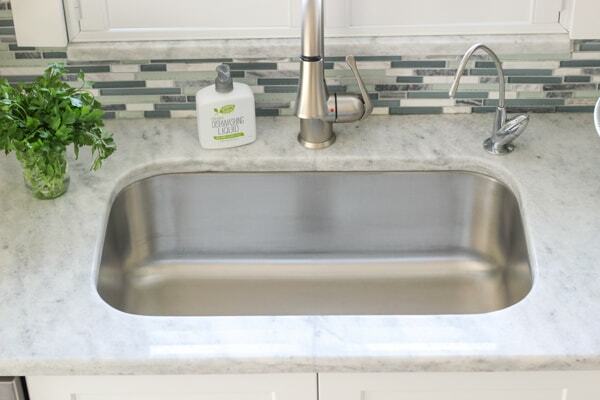 Sink: Single Bowl Undermount Stainless Steel Sink. We also bought the sink through Five Star Stone. I would highly recommend getting a single bowl sink. Having such a large sink is very useful. I can wash huge pots and cutting boards in it with no hassle and finagling, and can stack tons of dishes in there when I’m cooking up a storm while keeping my countertops free. We bought the faucet on e-bay, so it was half the price of what it would cost at the store and it was brand new too. The retractable spray hose is a really convenient feature. My favorite color is blue. Can you tell:)? My Dad installed all of the backsplash and he did a wonderful job. He is very detail oriented, so every little corner is done perfectly. We bought our refrigerator, double oven, hood and dishwasher on Craigslist. I couldn’t find a gas stovetop on Craigslist, so we bought in online. 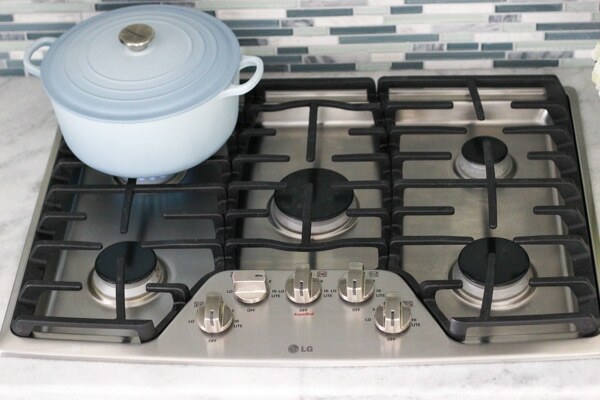 You can read more about why I chose a gas cooktop here. I’ll write a more detailed post about the rest of the appliances in another post. This particular model isn’t even sold anymore, but it works great. Here’s a similar model. Having a double oven has many advantages, especially when cooking for parties or making several things at the same time. Dishwasher: Samsung Top Control Dishwasher Model#DMT800RHS (this model is also no longer sold.) This is a similar dishwasher. Gas Cooktop: 30 in. Recessed Gas Cooktop in Stainless Steel with 5 Burners. More details about the cooktop in this post. Another big, messy job that Sergi tackled was stripping the popcorn ceilings in the entire house and then refinishing and repainting the ceilings in every room. That is probably the #1 thing I’m thankful that we completed while we were still living in the apartment. It was very dusty and dirty. Sergi wore a mask and I stayed away with the boys while that project was underway. 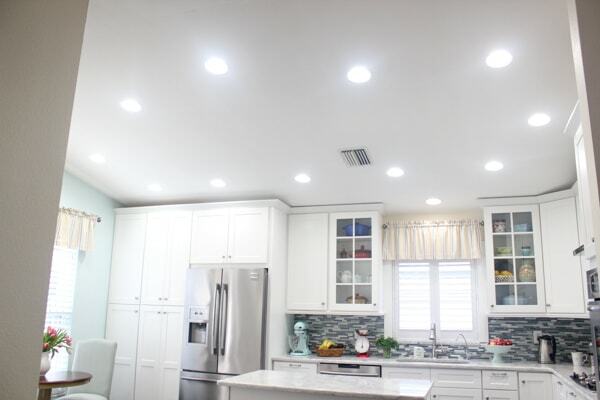 Sergi also took out the florescent lights in the kitchen ceiling as well as the ugly ceiling fan above the island and the other equally hideous hanging lamp in the kitchen nook area. With the help of my Dad, they installed recessed LED lighting in the kitchen. It’s a is very bright room now for sure! 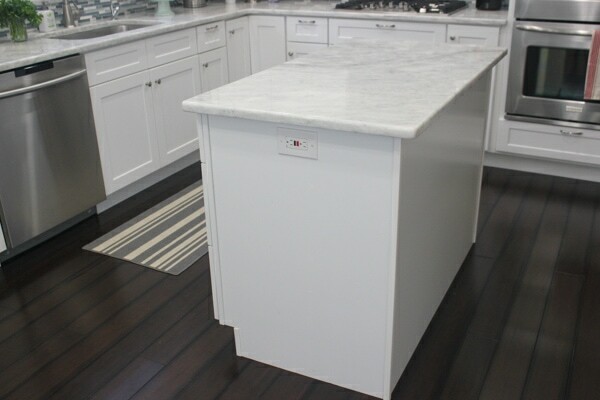 The kitchen island is a nice size, 52 inches long x 28 inches wide. It is twice the size of the previous island that was in the house when we bought it. I use this space more than any other in the kitchen. Sergi also installed an electrical outlet on each side, so I can easily use kitchen appliances on the island, charge my phone, etc. The kitchen nook is one of my favorite corners in the house. It’s so cozy. This is where Sergi and I eat most of our meals when it’s just the two of us. Nathaniel’s high chair will be the perfect addition right in between the two of us:). I can already imagine him keeping us company. I also like to sit here when I’m doing a lot of tedious kitchen prep, like chopping, shaping cookies, etc. Kitchen Nook table: Keeran Bistro Table from Pier 1 Imports We bought this table when it was on sale, and it’s no longer available in the color that we bought it. Chairs: Claudine Dining Chairs from Pier 1 Imports We bought these on sale as well, so I’m not sure how long they will be available either. The windows in our whole house had pink and green blinds. I’m not kidding. They were in really bad shape too, so we had to replace all of them. We installed the 2 1/2 faux wood blinds in every window in our house. We were very happy with the customer service that we got from blinds.com and the quality of the blinds is superb. If you’re in the market for blinds, I would highly recommend them. 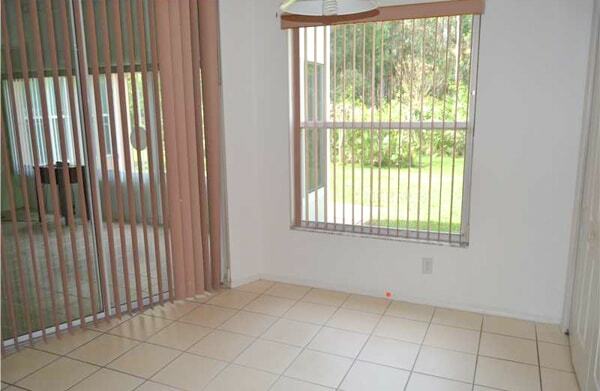 The price for the blinds is very affordable too. Of course, we bought them on sale too:). 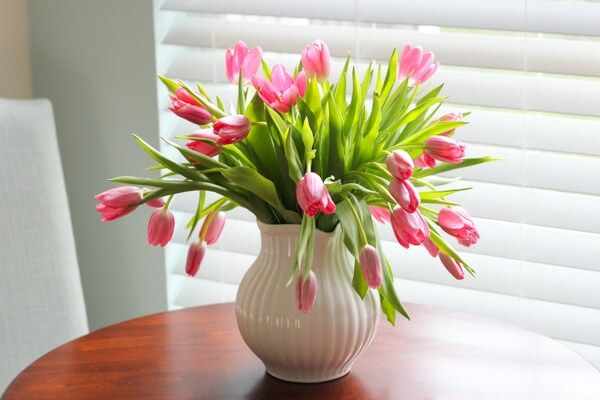 I was so happy that my absolute favorite flowers, pink tulips, just happened to be in the grocery store the same day that we were taking pictures of the kitchen. Aren’t they just beautiful? Whew! That’s quite a bit of information! I hope it’ll be helpful to those of you who are redoing your kitchens too. I will also take pictures of all the kitchen cupboards, drawers, pantry and give you a detailed look of that as well:). The kitchen is the heart of the home and we are so glad that this intimidating project is complete. Both Sergi and I love how spacious and functional it is. It is so satisfying to use it. Plus, we really like how it looks. We chose the exact style that we prefer – bright, minimalistic and, in our opinion, very elegant. Thank you, Julia:). Yes, I am so thrilled with everything that’s been going on in our life right now. So many outpourings of blessings. Beautiful remodel! God bless you two for not rushing and waiting to purchase your home:) We are inspired to also wait though it’s tempting when everyone is buying homes. 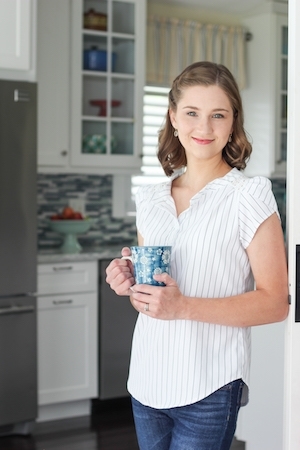 I noticed that your kitchen doesn’t have a microwave, I would love a post on how to actually manage that on a daily basis with kids and what you do instead! I am still pretty dedicated to my microwave so I am not throwing mine out but I do want to use it less just don’t know how to start. It is very hard to stay focused on what’s best for your family when you see many others moving on to something that you really want to have. I can certainly relate. I actually do have a microwave, but we hardly ever use it, so it’s stored in the higher cupboard above the double oven. I usually reheat everything in a skillet, a small saucepan, or even the oven. We only use the microwave on very rare occasions. It’s taken a while to make it a habit, but it gets easier and easier the more you use other methods to reheat things. We could probably get rid of it altogether, but it’s nice to have in a pinch, plus, it’s one that we’ve had for years and have the room for it. We haven’t had a microwave for years now. Due to the lack of space in our kitchen, I had to make a choice between a microwave above the stove or a nice hood that would function the way it was supposed to. We ended up choosing the hood. I can honestly say I don’t miss the microwave a bit. We bought a small toaster oven that we use to reheat items that don’t reheat well on a stove. This way we don’t have to heat up the entire oven to reheat a few pieces of chicken or steak. It’s funny because I will often be at someones house helping out in the kitchen and will habitually heat things up the way I do at home and I always get asked why I just didn’t use the microwave… then I just have to explain myself. The food DEFINITELY tastes better when NOT heated in a microwave. I agree, Larisa. Reheating on the stove or in the oven or toaster oven is so much better. We do have a microwave, but I hardly ever use it. (We’ve had it for almost 10 years. I don’t plan on replacing it when it eventually stops working.) I have a really small skillet and a tiny saucepan that I use when I need to reheat something really small and it works great. You guys have done an awesome job! The kitchen looks fabulous!!! Thank you, Natalya. We are really enjoying it. YOUR KITCHEN IS SO BEAUTIFUL. I AM SO HAPPY FOR YOU. YOUR SITE IS ONE OF MY FAVORITES. I HOPE YOU WILL TAKE ANOTHER PICTURE OF YOUR NOOK WHEN THAT HIGHCHAIR COMES ALONG. EVEN THOUGH I DON’T KNOW YOUR FAMILY PERSONALLY I FEEL LIKE I AM A PART OF IT. GOD BLESS YOU. LOOKING FORWARD TO WHAT YOU WILL BE TURNING OUT IN THAT BIG KITCHEN. Thank you, Tamara. The high chair will be such a fun addition to the kitchen. Can’t wait. Thank you for taking the time to write. I’m so happy to hear that you are enjoying my website. I love getting to know my readers on a more personal level. I realy like your kitchen! It is so bright and beautiful, and so much space! I also have to remodel my kitchen and already have couple ideas, but still thinking about making it to be convenient since I love to spend my time there. For me also kitchen is the place where I use the most of my time cooking differentbkind of meals for my family! 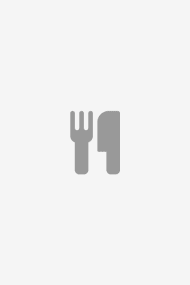 I use a lot of your recipes, they are really great and delicious! Thank you for sharing those, as well as sharing all the things from your life and your house! May God continue to bless you abudantly and your comming baby!!! So happy for you! Thanks for such a sweet comment, Svetlana. The kitchen is where I spend most of my time too, so it’s a pretty important part of the house. I’m thrilled that you are enjoying my recipes. Your kitchen is GORGEOUS!!!!! You and your husband have a great taste!!! That’s so sweet of you to say, Olga. We made the kitchen into something that we enjoy using and looking at, so it’s nice to know that others like it too. What a beautiful kitchen and has such a warm and welcoming atmosphere. 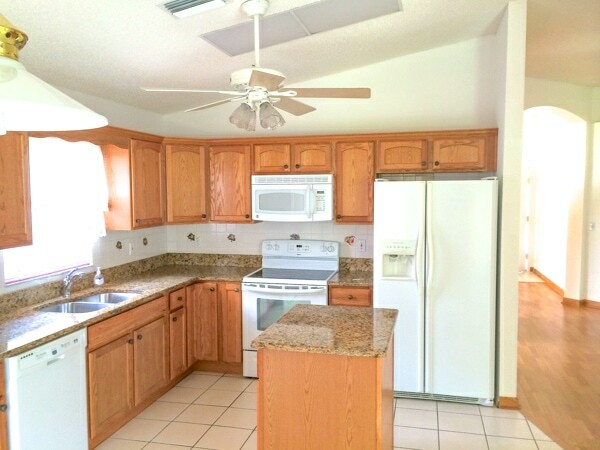 I’m sure a lot of great meals and memories will be created in this kitchen. Thanks for sharing. I’m so happy to hear that. I really want my entire home to be inviting and cozy, so I’m happy to hear that you think it’s warm and welcoming. Love love love your kitchen! You guys did a fantastic job! Like from the front page of a magazine! Wow! Magazine, huh? That’s very sweet of you to say, Natalya:). I just found your website and already bookmarked it! I am married for about 8 months now. Before that I didn’t like too much to cook, but now I enjoy cooking :)) That’s funny I know. I just love how my husband likes what I am doing :). So your websites is a good source of new recipes .Thanks again. Btw, I love your kitchen ! Hope you have lots of good times in there ! Your comment just really made my day. I have a special place in my heart for newlyweds. 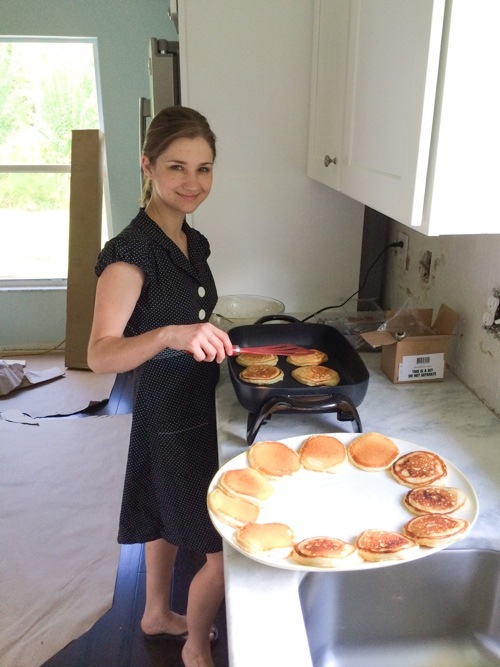 I have such warm memories of my first few years as a homemaker. I’m so glad you are enjoying the website. 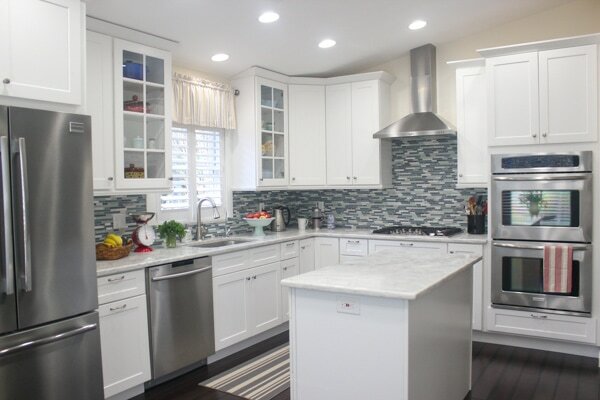 Thank you for sharing your beautiful kitchen renovation. You are very inspiring! I accidentally found you on the internet about a month ago and have been trying many of your recipes since then. They are all wonderful! Thanks so much!! Thanks for stopping by, Kimberly! I’m so glad you stuck around:). I am loving the renovations! So beautiful! You guys did a marvelous job! So happy for you and your growing little family 🙂 bless you! Amazing!! Really stunning!! Congrats to you! You’ve done a beautiful job! The kitchen really is the heart of the home. . .and you’ll make so many happy memories there. Enjoy! Wow, what a beautiful and elegant space!! All the colors and decor are perfectly on point, it’s so homey and cozy yet stylish and modern. Good work!! God bless your growing family in your new home!! What a lovely compliment. Thank you for the kind words, Alena. Very beautiful kitchen!! Good Job! We are currently trying to plan our kitchen for our new home so this is very helpful. Actually I was wondering why you think the fridge is more convenient in the new location that you placed it instead of the place where it was before the remodel? 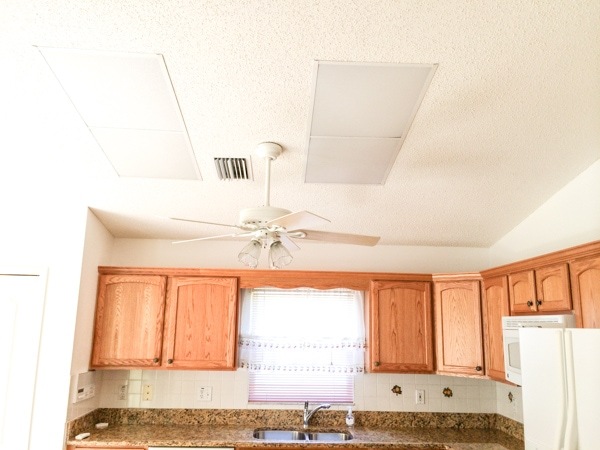 The kitchen we’re planning has the same layout as yours, its been a struggle to decide where to place the fridge. So your advice is very helpful. Thanks! Of course, it’s very personal and works out this way because of the way we have everything else laid out in the kitchen. It may work out differently for you. First of all, the refrigerator stuck out a lot more in the first location. The double oven is flush with the rest of the counters. Even though the refrigerator does still stick out a bit from the counters, we were able to make the pantry bigger, since they are right next to the fridge. Bigger pantry – always good! Second of all, I like having the double oven really close to the stovetop, so I can easily move things from the stove to the oven and vice versa for many recipes. Third, I like having the the pantry right next to the refrigerator, as well as the trash containers and the drawers where I keep all my plates:). It’s the perfect setup for the way I use the kitchen. Your kitchen is so beautiful. Sitting here in my tiny apartment kitchen I can only dream about having one like yours one day. Your website has become my cook book, thank you for the many many tasty recipes you’ve shared with us so far. I dreamed of a kitchen like this for many years in apartments too, Natasha:). Your new kitchen looks exactly as I have my new kitchen planned out to be done (this spring). 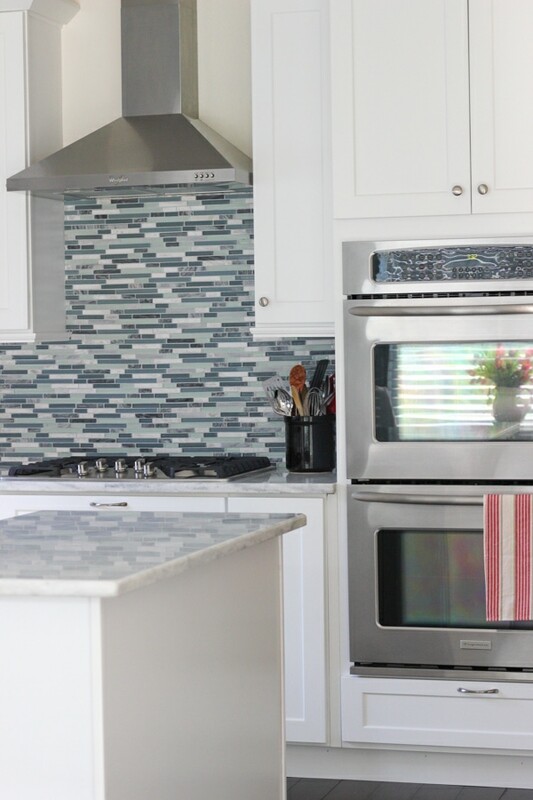 Absolutely love the white and gray and blue colors in your kitchen. So peaceful and welcoming. You and your husband did an AMAZING job , way to go !!!! Enjoy your new kitchen ! Good luck with your kitchen, Estera! Even though it’s a lot of work, it’s really worth it, and fun to plan and see it come to life. Thank you dear for sharing your lovely kitchen with us. I enjoy seeing other people’s homes That are so pristine and organized- makes me want to get up and re-organize again. Off the subject… But I think you look so lovely with your slightly longer hair. summer is coming up and it might be tempting to cut it, but I like the look of it. It suits you well. Would like to see the rest of your home:) on your terms of course. I love looking at other people’s homes too, and get organizing and styling ideas. SO fun. It is so beautiful! I love the light. I appreciate all the work and also the wonderful design that you did with used/sale products (we built our own house a learned a lot). A+++….. 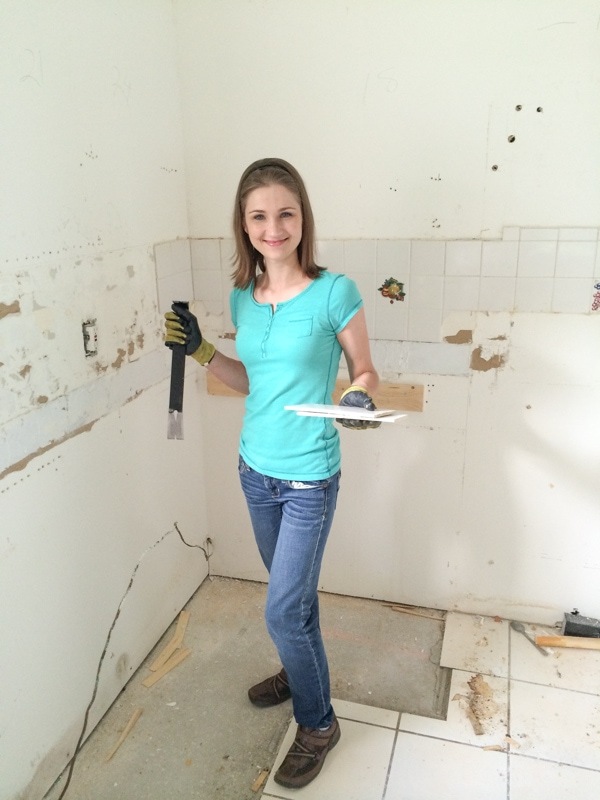 If you ever want second jobs – you two could consider kitchen redesign!! That’s so sweet of you to say, Kel:). We’re not designers by any means, but it was a lot of fun. 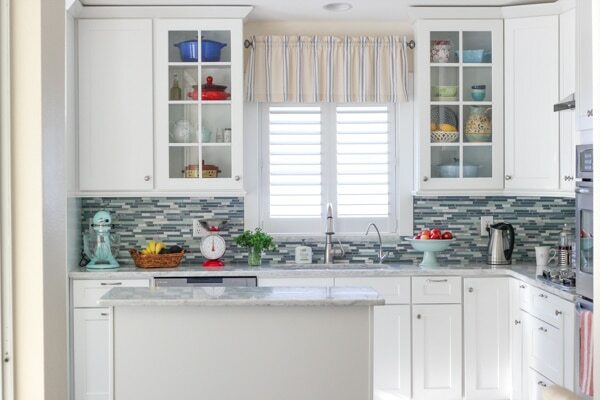 Love the pops of color against the white kitchen!!! Thank you, Katya. Since our kitchen has so much white, I thought it would be nice to add some color to it here and there. Wow, I’m so in love with your kitchen. So clean, spacious and elegant. Just like you described. I love everything in it. That backsplash is such a pain to work with. Kuddos to your dad, he did a wonderful job! The backsplash was A LOT of work. Dad spent hours on it. He was so generous with his time and effort. We couldn’t have done the remodel without him and my brother, Valik. Wow, beautiful kitchen! So fresh and clean! I love carrera marble as well but went with a white/gray/black granite because of durability, just like you. I have not seen that kind of granite in any stone yards I’ve been to and would never have guessed that’s not marble! I would have definitely chosen White Everest had I seen it. Also love that you did a lot of craigslist shopping. Good job and God bless! I am so glad we were able to find something that looks very similar but is much more practical, especially for a very well used kitchen. Craigslist shopping definitely saved us A LOT of money. Your kitchen looks beautiful! Everything blend so well with each other. We have been really blessed, Courtney and are really enjoying the new kitchen. Wow! just wow! I think I’m in love with your kitchen! I am so happy for you and for all these great changes that are happening in your life! Thank you so much, Marina! It really is so exciting. A lot going on and it’s such a blessing. Wow Olga! Your kitchen looks amazing. I agree, a kitchen island is very useful that’s where I do all of my baking. Especially when I am making like 100 cookies 😉 keep updating! Yes! The island is awesome. I didn’t have one in any of the apartments where we used to live, so I am really enjoying it now. Wow absolutely gorgeous! Thank you for sharing! Would LOOVE the whole house tour 🙂 Blessings to your growing family! Thank you, Lena. I appreciate it. The rest of the house is still a work in progress:). Everything has come to a standstill since I became pregnant and don’t feel good and since we don’t want to spend any more money to make sure we have enough savings set aside. With all the medical expenses that we have every week, plus upcoming deliver and hospital bills, we want to be prepared. Thank you, Liliya. I appreciate it. I don’t feel comfortable answering the cost question. Prices vary a lot, and it depends a lot on the square footage, how many stone slabs you need, what type of material you use and the company that you use for installing them. Your best bet is to get a quote once you are ready to install the countertops. A beautiful and practical kitchen, you guys did a great job. I wanted to ask about the floors: I have tile in the kitchen and it is constantly cleaned because I cook a lot and messes happen, of course. I can’t imagine how wood floors would handle such “abuse”. Could you share your experience with that? Thank you, Mila:). I am a very practical girl, so that was most important to me:). About the floors – I cook A LOT, so the floor does need to be cleaned a lot more than the rest of the house. I am sweeping it a few times a day and wash it much more often than the rest of the house too. No matter what type of floor it is, it still needs to be cleaned the same amount of time. For bad spills or anything like that, I just clean it up right away. I haven’t noticed any difference between these floors and the tile or laminate that we had in our other apartments. I prefer it a lot, actually:). Thanks for your reply, Olga. It is good to know that you haven’t noticed any difference between wood and other type of flooring. I was specifically interested to hear your opinion because I know you cook a lot, just like I do. Plus I have four kids– lots of spills! I think I would be paranoid about having to wipe every spill right away. It seems to me that to properly clean floors in the kitchen, as opposed to the rest of the house, you need to use water all the time which may be damaging to wood. I tend to think a lot depends on the type and finish of the wood floor– some are more moisture resistant than others. If something spills, I would wipe it up right away, no matter what type of floor I had:). I guess I’m paranoid too. Wow Olga, your kitchen has so many things like my kitchen! So funny to see 🙂 We completely remodeled our kitchen 2 years ago also; had it custom built; we have the same cabinets- our trim on the doors is just a little bit wider. 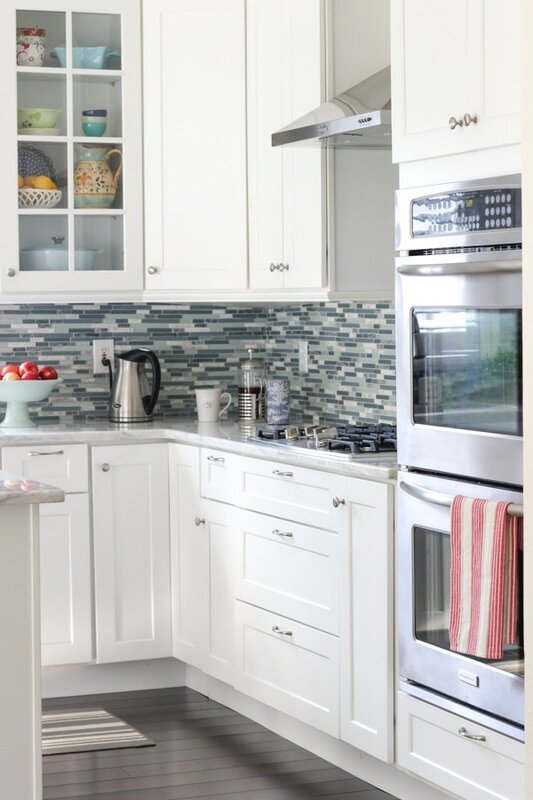 We have white quartz countertops; and the backsplash is almost exactly the same except our tiles are a little bit wider than yours, otherwise same color and everything. I even have the same teal fruit bowl! Mine I think is just a little darker teal color. To the girl who was asking about the floors- I just wanted to say we also installed wood flooring in our kitchen and I love it so much! I don’t regret one bit getting wood floors, and never ever want to go back to tile. My wood floors are Australian Cypress- a light golden color with a lot of dark ‘knots’- very natural looking- so the little dings/scratches we have gotten so far only add a more natural look to the floor and we love it! 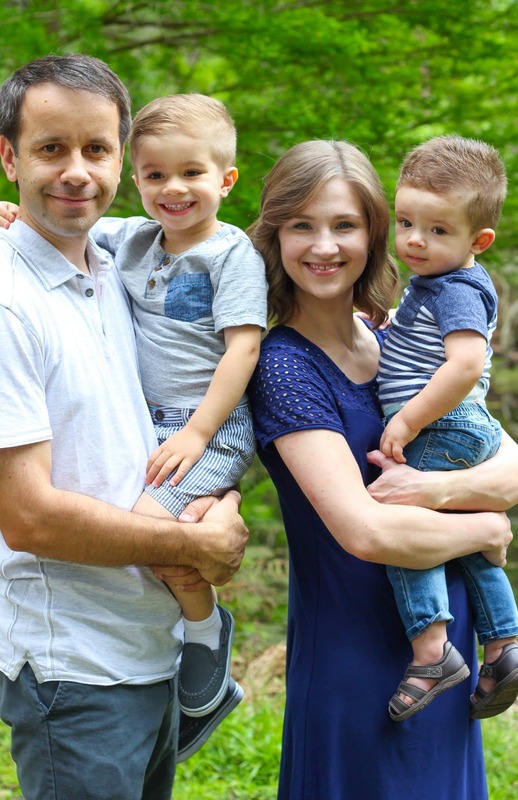 Thank you Olga for your hard work on this blog, we really appreciate your time! It’s so interesting to see other kitchens:). Seems like we have a very similar style. Olga, what a pretty kitchen you have!!!!! Gorgeous!! I would spent all my time just cooking and baking in such kitchen!!! :)))) great job! I spent most of my time cooking and baking even in tiny apartment kitchens, so this is certainly a luxury that I am enjoying. Olga I love your new kitchen. I cant imagine how happy you must be that everything is done and done the way you want it. it looks absolutely beautiful clean and bright. 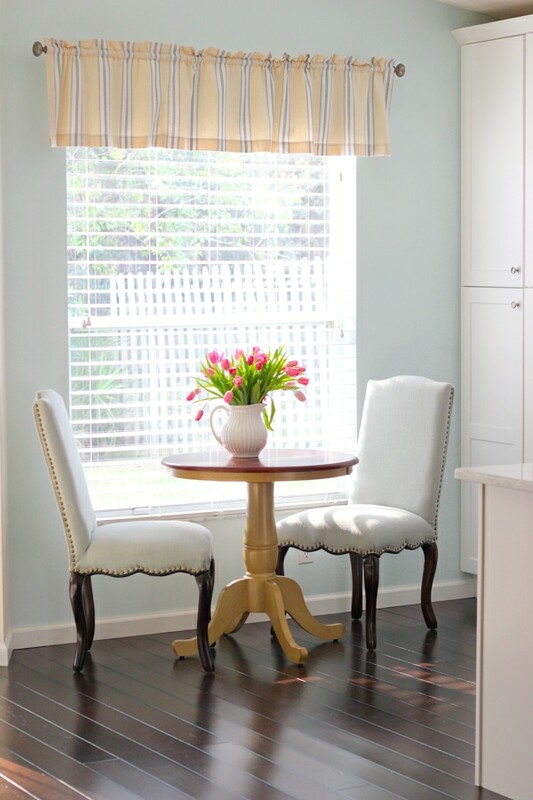 I love the little window at the sink and the table and 2 chairs by the other window. So perfect. 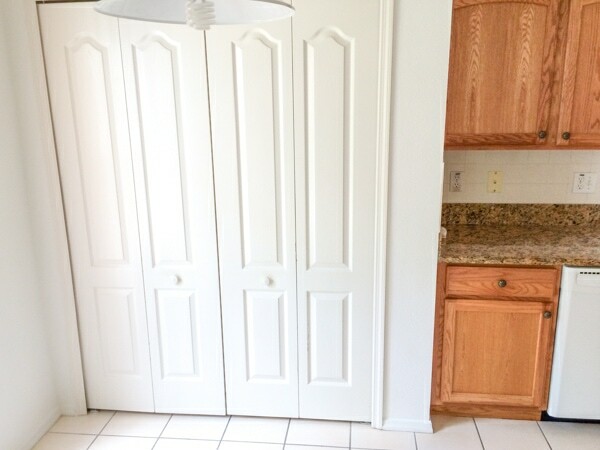 I’m very curious as to what the cabinets by the fridge are hiding 🙂 Iove the wall of cabinets and i assume it is your pantry in a unique cabinet look. Looks beautiful again and congrats!! Thank you so much, Ana. I’ll definitely share where I store everything at some point. Absolutely love your kitchen! I will be moving in with my boyfriend in a couple of months and one of the conditions was is for him to redo his kitchen! I know this might sound very high maintenance on my part but if you saw his kitchen, you would totally understand me! haha The man’s oven hasn’t worked for over 2 years! I’m a big cook and need a decent kitchen…or at least a working oven! Anyway, I am using your kitchen as inspiration…well actually, I wouldn’t be shocked if it turns out looking exactly like yours ;). We purchased cabinets last weekend and after reading your post today, I realized that they are exact cabinets! White Shaker! We got a good deal on them as well so I hope the quality will not fail us. 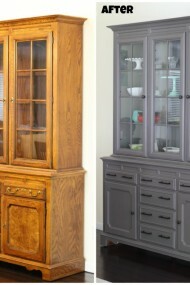 Are you still happy with your cabinets? Thanks for the post! Love reading it and totally in love with your kitchen! I love your kitchen!!!! It is like my dream Kitchen! God bless you and your husband and your little precious baby! Thank you so much, Julia:). Hi Olga:) I don’t know if you’ll see this I just dot know where else to ask you this question. How do you keep up with dark floor? We are in the process of building a house me and my husband really like dark floor and everybody tells us not to do it because you can see all the dust and dirt on dark and that I’ll have to clean it very often. What do you suggest since you do have a crawling baby that makes it even more dirtier. I personally sweep the floor in the main areas where we are all the time every day, Lina. It only takes me a few minutes and I’d rather see the dirt and take care of it, then have it blend in:). I don’t have a problem keeping up with the dark floors. We have them everywhere in our home, and I don’t sweep them everyday, only the kitchen and living room gets a daily sweep. Otherwise, I sweep a few times per week in the rest of the house. I do mop the floor in the kitchen at least every other day, but that’s because I cook A LOT and I have a baby who has sticky hands and is my constant shadow, so he creates a lot of messes, crumbs, spills things and leaves handprints everywhere.The rest of the house also doesn’t get mopped more than a few times a week, usually once per week. Your kitchen turned out beautifully. I live in Ft. Lauderdale what part of Florida do you live in?